Minimal Residual Disease (MRD) is a powerful risk-stratification marker in the treatment of primary and relapsed childhood Acute Lymphoblastic Leukemia. Flow Cytometry (FCM) is a fast and sensitive method to detect MRD, however, the interpretation of these multiparametric data demands intensive operator training and experience and no reliable automatic assessment technology is nowadays available (see also AutoFLOW project website). Neural Networks are getting really popular and have been recently employed in many Machine Learning and Computer Vision applications with outstanding results. The application to MRD assessment on the other way is not that straight forward because of the complexity of the data. Provide motivated different solutions to approach the problem, compare the proposed method against the state of the art. We gratefully acknowledge the support of NVIDIA Corporation with the donation of the Titan X GPU used for this research. Krizhevsky Alex, Ilya Sutskever, and Geoffrey E. Hinton. 2012. 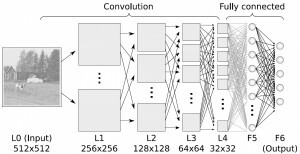 “ImageNet Classification with Deep Convolutional Neural Networks.” In Advances in Neural Information Processing Systems 25, edited by F. Pereira, C. J. C. Burges, L. Bottou, and K. Q. Weinberger, 1097–1105. Curran Associates, Inc.
Szegedy Christian, Wei Liu, Yangqing Jia, Pierre Sermanet, Scott Reed, Dragomir Anguelov, Dumitru Erhan, Vincent Vanhoucke, and Andrew Rabinovich. 2014. “Going Deeper with Convolutions.” arXiv [cs.CV]. arXiv.